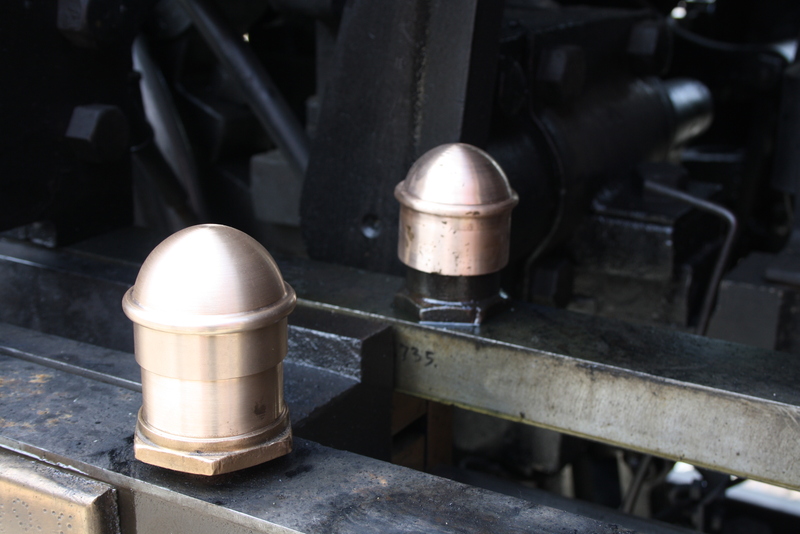 Like all bearings on the locomotive, the crosshead guides require lubrication. 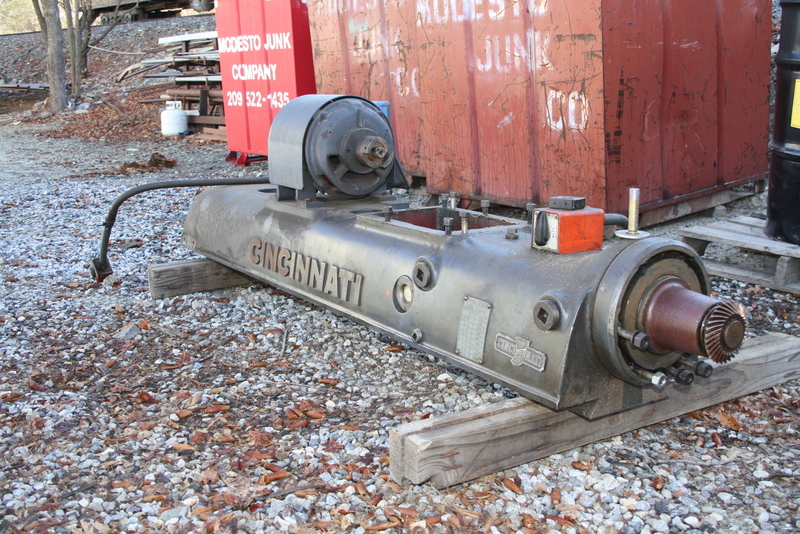 An oil cup is mounted on the top of each crosshead, and slowly releases oil during operation. 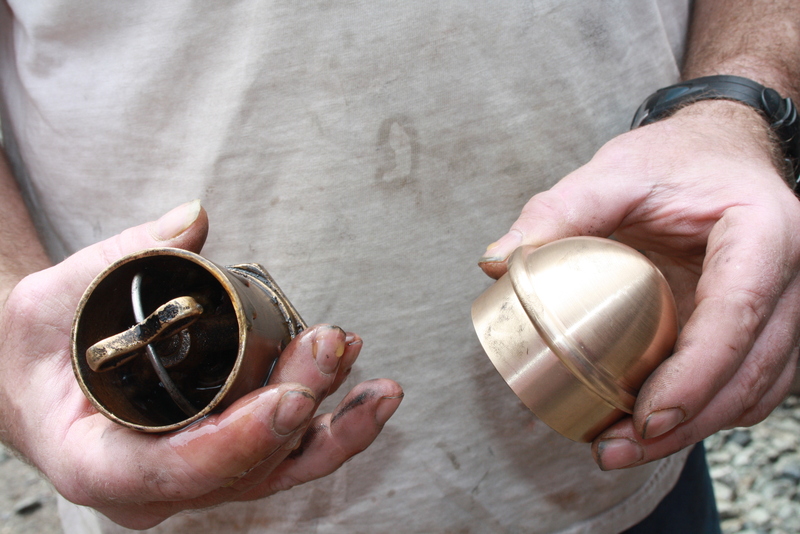 The cup is covered with a brass cap to keep the oil from sloshing out. 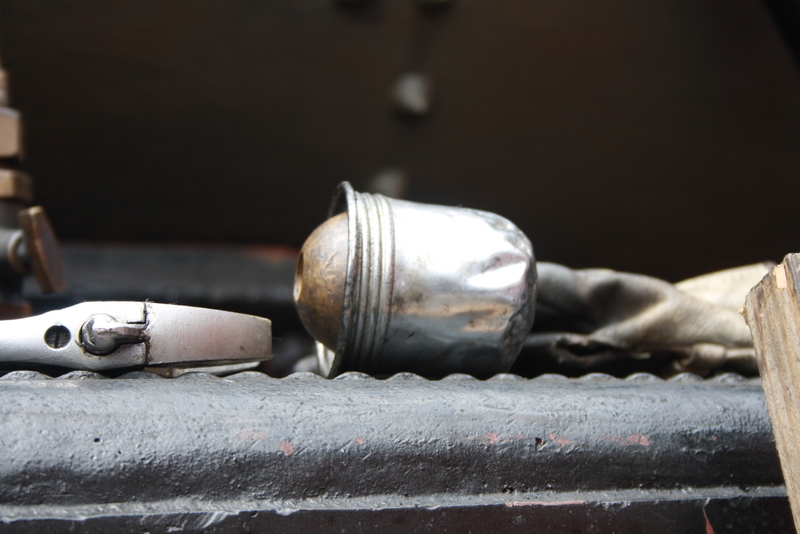 While it is difficult to see in this old photo, the oil cup covers in the past have been different than the ones found on the locomotive today. 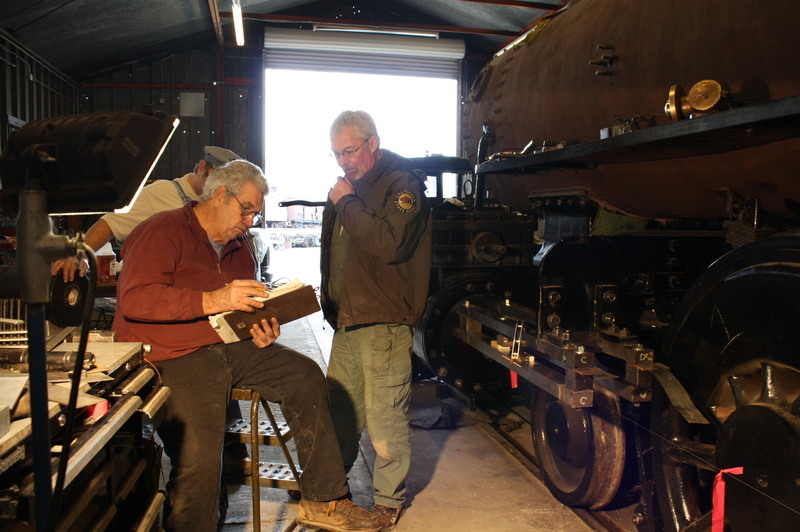 As with many parts, they were interchangable with other locomotives in the roundhouse over the years. If you look closely, inside the circle, you can see one of the oil caps that was used on the No. 3 for many years– an old, beat-up, thermos cup. Examples of this type of ingenuity can be found throughout the shops, but we thought the No. 3 deserved better. 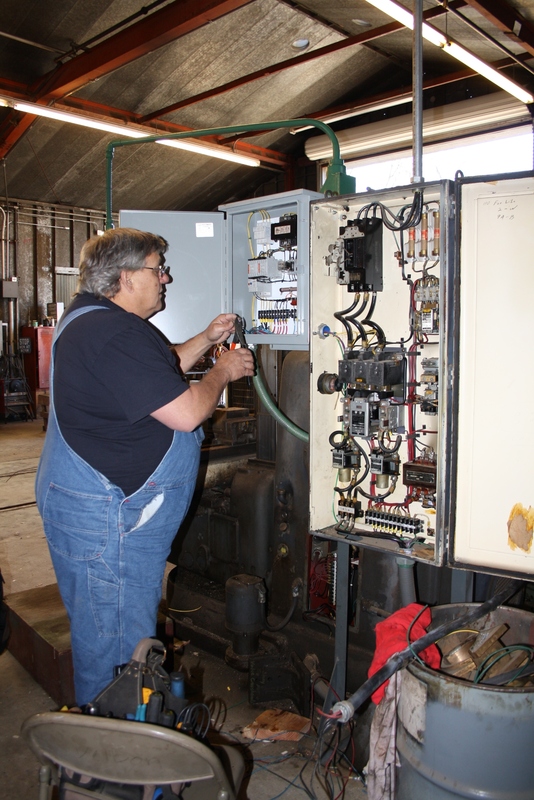 Volunteer Machinist Tony Stroud duplicated one of the old oil cap covers to replace the thermos cup. In his hands are the oil cup (left) and the new cover. Ta Da! Matching oil cup covers. Tony Stroud reams one of the final holes on the crosshead guides. 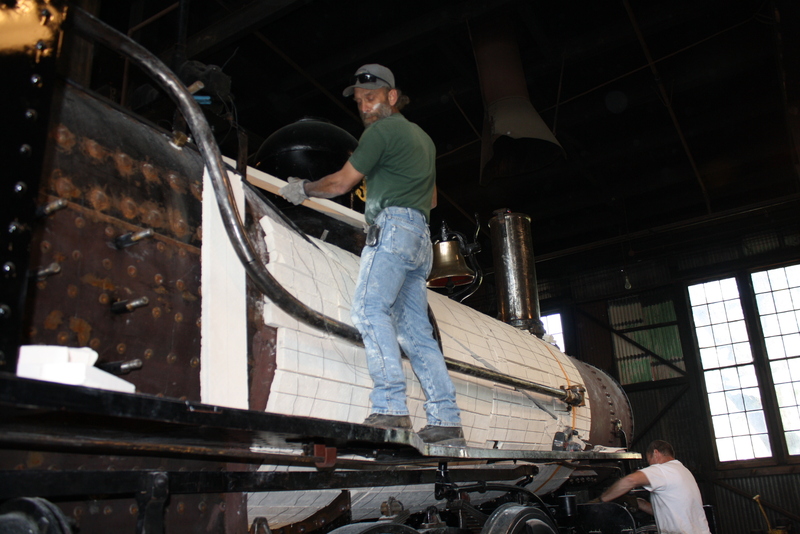 The smokebox overhead will remain devoid of insulation. Phil Hard finishes off the week by finishing off the lagging! Ready for final jacket measurements on Monday. The boiler is insulated with rigid sheets of calcium silicate which are scored (and cut where necessary) and held into place with wire. They will be neatly covered with a sheet-metal jacket as the final layer. The crossheads and guides are mechanisms that ensure that the piston rod only moves in the same direction of travel as the piston. 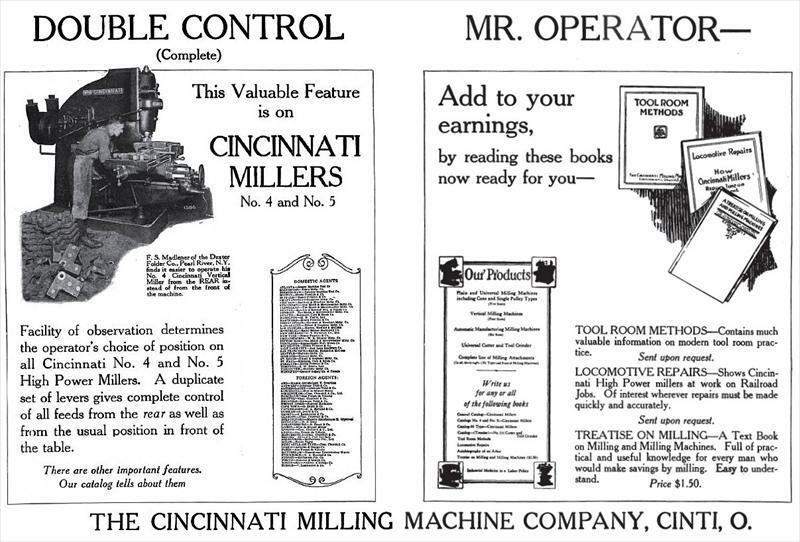 Since the rods are connected to the crank pins on the driving wheels, without the crossheads and guides, there would be excessive transverse force, which would cause wear on the piston, and create a great deal of friction. This process is much easier to understand in action (click the image to activate animation). The movement of the crossheads and guides can clearly be seen in this animation. 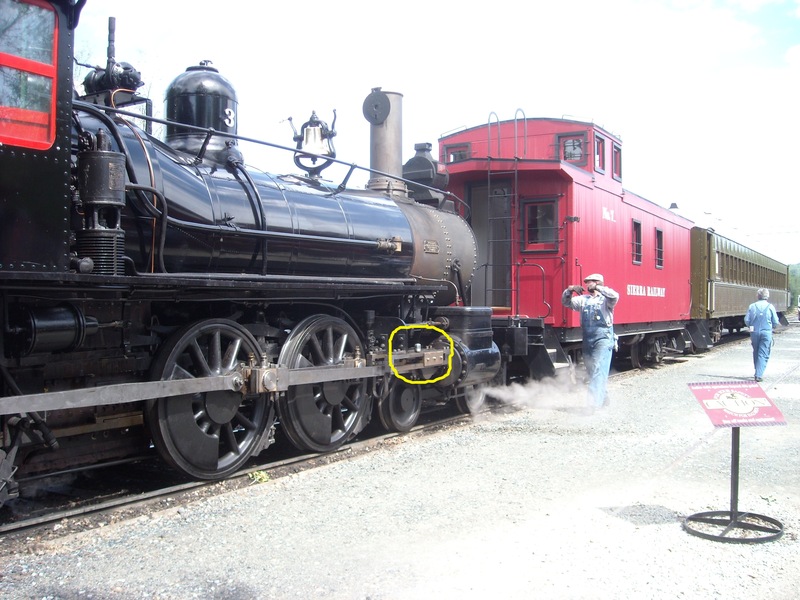 Notice the two long rods to the right of the driving wheels (crosshead guides), and the mechanism that slides along them (crosshead). This particular image depicts a different type of mechanism that can be found on the Sierra #3, but the idea is simliar. 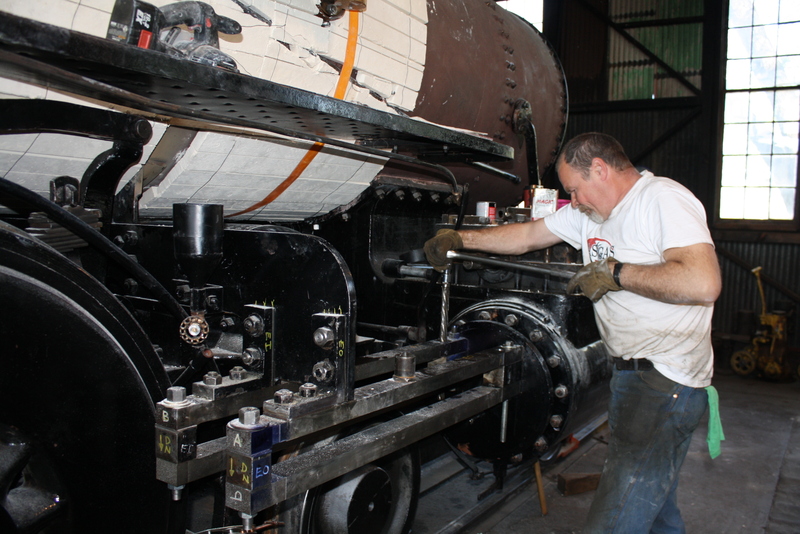 Much work has been required to refurbish the crosshead guides on the Sierra No. 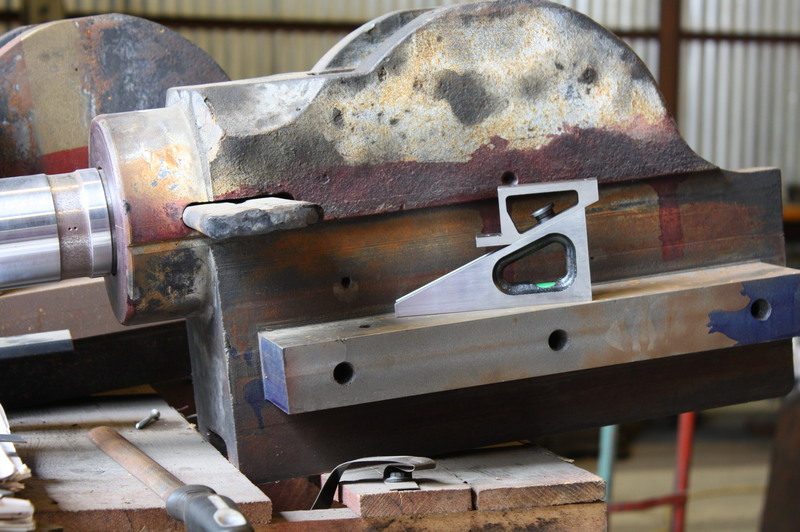 3, including machining 4 new guides (the long rectangular rods the crossheads slide back and forth on). 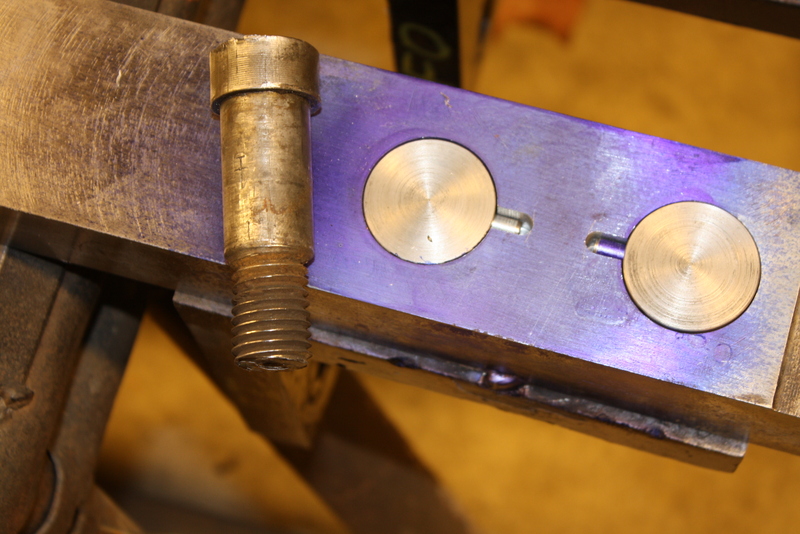 Bob West is currently measuring to machine the new brass (yes, another bearing surface!) for the guides. We have been very fortunate this past couple of months. 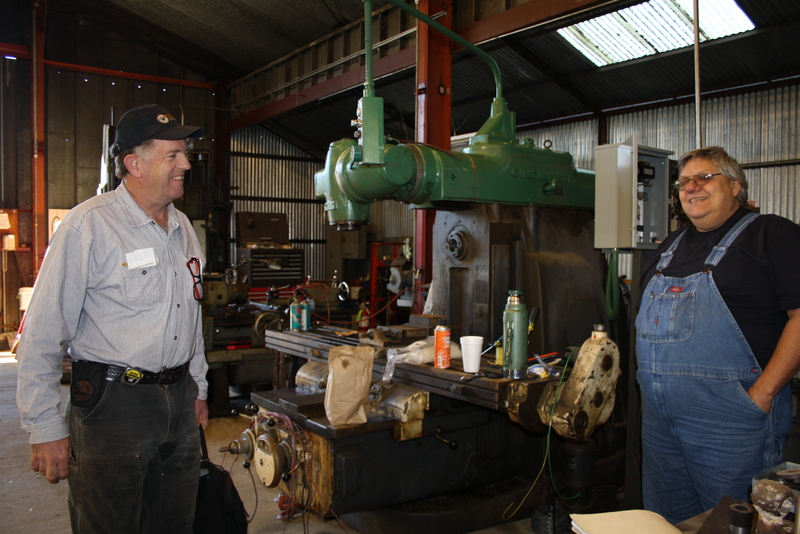 Mike “Tony” Stroud and Ted Bray , two Columbia area machinists, have been volunteering in the shop. That has sped up the work and helped keep the project on schedule. 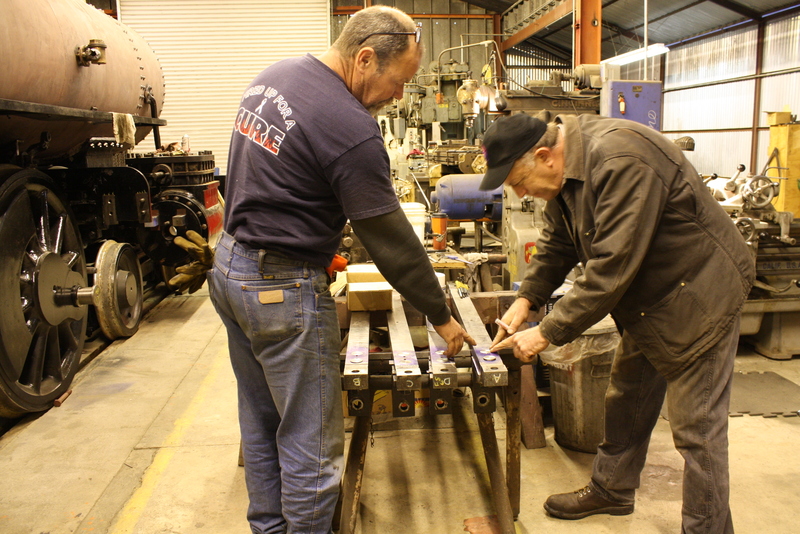 Volunteer Machinist, Tony works with George on the guide pins. Tony's handiwork. Two new pins adjacent to the original. 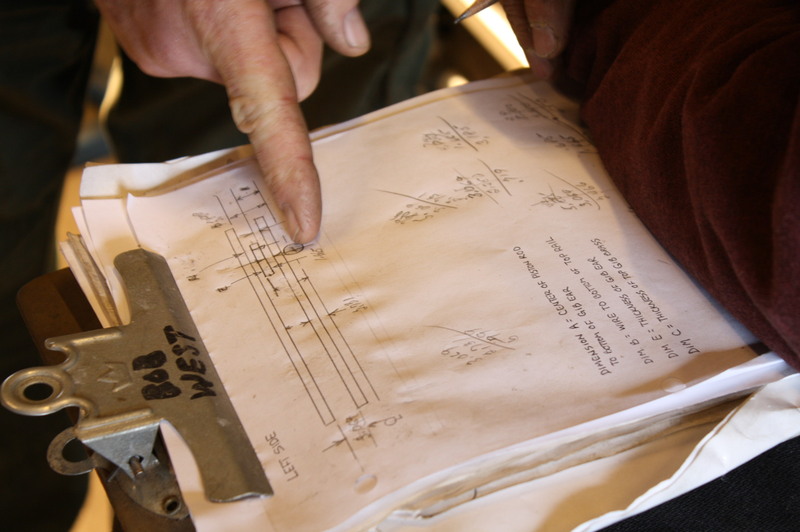 Bob West and Rob Buchanan review numbers for crosshead guide measurements for a final time, in preparation for machining the brasses. Checking measurements against the guides themselves. 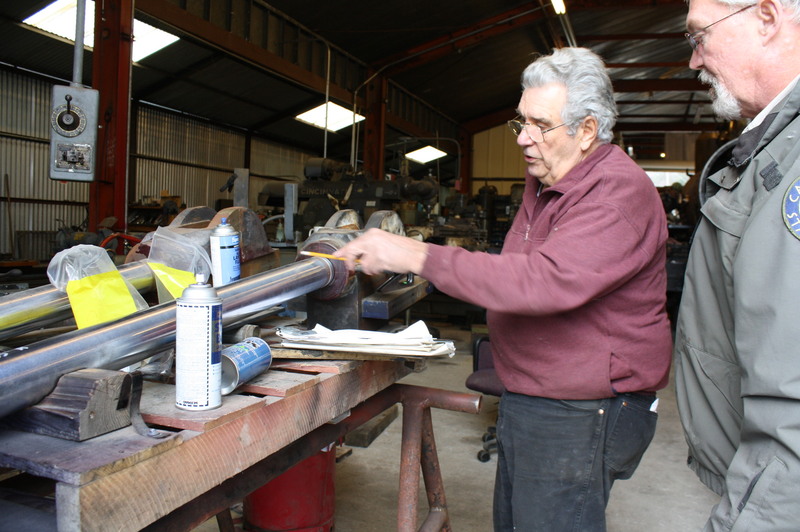 Bob discusses how measurements are taken of the piston rod diameters. 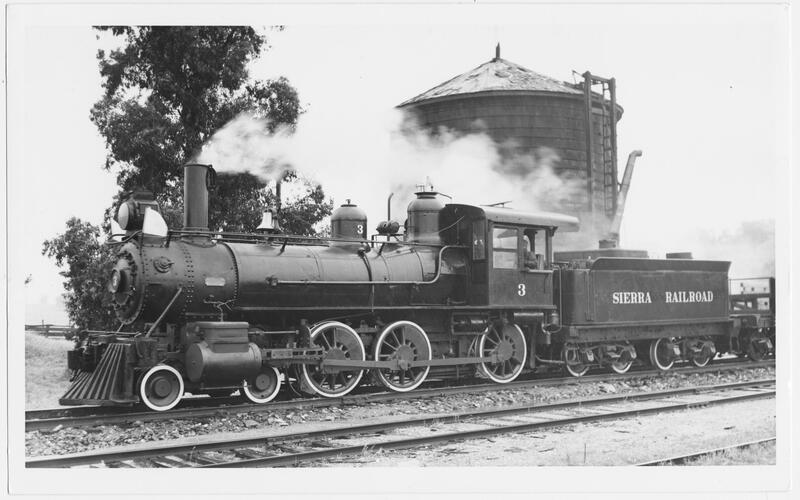 Citation for animationThe Sierra #3 is equipped with Stephenson-type valve gear, rather than the Walschaerts displayed. We’ll explore these interesting adaptations in a future entry.